CHICAGO – While normally I’d never think the date I screened a film was newsworthy, being subjected to “Jack Reacher” on Dec. 13, 2012 turned out to put even a therapist into therapy. The very next day, well, just two words: Sandy Hook. The theme of a senseless mass shooting in this Tom Cruise movie turned out to foreshadow the actual massacre at that condemned elementary school in Newton, Conn. Anything but serendipity, the cinematic-turned-true event still has me reeling and will most certainly have audiences feeling déjà vu. The film almost feels disrespectfully “too soon” to see now that it’s opening day, but the show must go on. This surprisingly rated-“PG-13” film on its relatively low $60-million budget is an attempted cross between Tyler Perry’s “Alex Cross,” “Dirty Harry” and – dare I even utter his name? – the unparalleled Jason Bourne. Read Adam Fendelman’s full review of “Jack Reacher”. While Bourne could dogfight Reacher with two hands tied behind his back, his man sack squished in a vice grip, a pirate eye patch covering one eye and the safety left on his Sig 228 gun while smoking some serious Maui wowie reefer to dull his mental acuity, “Jack Reacher” does have one twist you’d never expect: its star isn’t its title character. International man of mystery Werner Herzog – who typically sits in the writer/director chair rather than appearing on camera – does more for “Jack Reacher” in his five or so scenes than Tom Cruise could do if Reacher had enough screen time to film “Schindler’s List” 10 times over. “Jack Reacher” stars Tom Cruise, Werner Herzog, Rosamund Pike, Richard Jenkins, Robert Duvall, Jai Courtney, David Oyelowo, Vladimir Sizov, Joseph Sikora, Michael Raymond-James, Alexia Fast, Josh Helman, James Martin Kelly and Dylan Kussman from writer and director Christopher McQuarrie based on the novel by Lee Child. The film, which has a run time of 130 minutes and opened on Dec. 21, 2012, is rated “PG-13” for violence, language and some drug material. Continue for Adam Fendelman’s full “Jack Reacher” review. 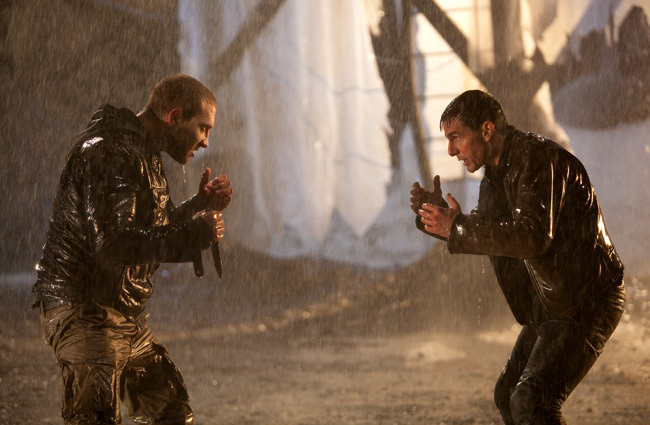 Jai Courtney (left) and Tom Cruise in “Jack Reacher”.